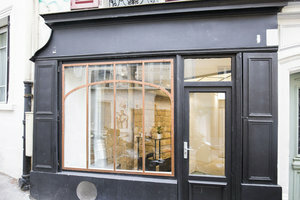 This compact 25 sq m shop space is located in the lovely area of Montmartre and is ideal for Pop-Up Stores. The space has a classic frontage finished in black with a large display window. Inside the space has been finished to an excellent standard with modern fixtures and fittings. Minimal interiors of light walls, wooden floors and contemporary furniture create a welcoming atmosphere. 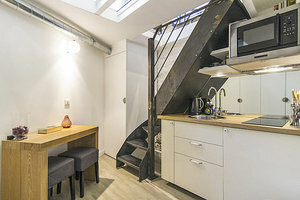 The space is divided over two floors with a small kitchen at basement level. 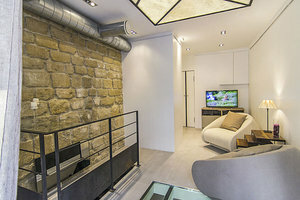 Located close to Abbesses with popular bars and restaurants, hotels, galleries and theatres in the surrounding area, this space is in a cultural and creative area.